The species is widespread in the southern half of Britain, with a few mainly coastal records further north. It is widespread in western and central Europe. As in central Europe (see H�nggi et al. (1995)), this spider does not seem to have a well-defined habitat niche in Britain, although it seems particularly abundant in grasslands and heaths. E. frontalis has a rather catholic diet, which may include insect eggs. It is only caught during the day. 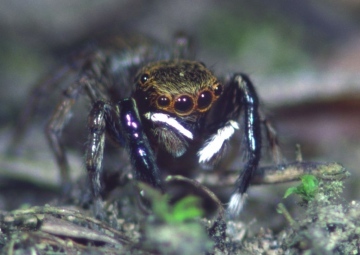 Males can be observed acting out their complex courtship which involves behavioural cues using both their legs and palps (Bristowe 1929, 1958). During a resting period, E. frontalis may be found in a silken cell placed under stones or in litter. Females guard the egg-sacs which contain around 20 eggs each (Bristowe 1958). Adults of both sexes have been recorded between April and October, but mainly in May, June and July with females occasionally persisting into the autumn and winter. Euophrys frontalis male. Short open moss turf in woodland ride.